Steve and I have been married for almost twelve and a half years. We will make that mark on November 18. But we have been together for twelve months longer than that, since May 18, 2001. I will remember those dates until my mind is completely gone. If I never remember anything else, I will remember those. Ah, love. How’s my little Apple-Oat Cookie this morning? Did you sleep well? I slept so-so. Sometimes when I go to bed later than my normal time, I have a hard time sleeping. It’s like my sleep rhythm is thrown out of whack, and sound sleep does not come as easily. Anyway, here I am, back in the office – again! It should be the same ol’-same ol’. Well, punkin, I hope you have a great day! Every day. Just like the sun comes up every day. I receive this beautiful greeting from my love and it is the gift I need each morning, just like seeing the sun. It makes the day start off with the warmth of a hug…only it comes electronically. Notice the line after the “Hi Julie!”? This was from yesterday. 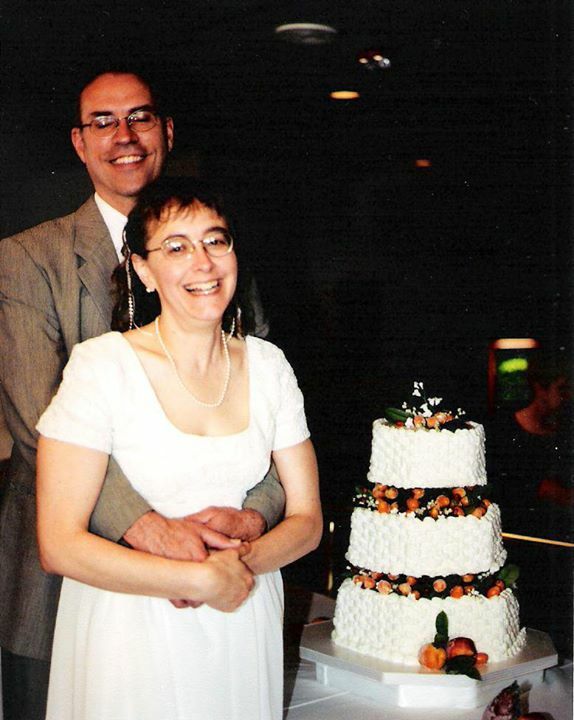 I was his “little apple oat cookie.” Every day for thirteen and a half years Steve has called me his little…dessert. Sometimes sweet. Sometimes savory. Sometimes with chocolate. Sometimes with fruit. Sometimes with nuts. Always dessert. I asked him once a very long time ago why he did this. “Because that is who you are to me. Something so good that I just want to eat you up.” I would never in my most romantic thoughts have dreamed up someone like Steve. He just came into my life and made it so much better and I have never looked back. He is the dessert that came to me that I never asked for. “What? Wow! This is for me?” No trick there, only treat. And then at the end it’s “punkin’.” He’s got so many sweet names that he calls me (and some I won’t share because they are too dear) that when I look in the mirror and just see plain old Julie, it knocks my socks off. He sees something different…and I love him for it. The best name he ever gave me was Mrs. Stephen Burgess. And so today I present the first of many lists in this blog. You can watch and see if it ever repeats. It rarely does, and if it does, it is usually on our anniversary. And when that date rolls around, May 18, I close my eyes and see the cake we picked out together to celebrate. With great love to my top chef. I know, mushy. But you should see how long the rest of the list is!